The new media drop-box sits astride the Upper Shores parking lot. 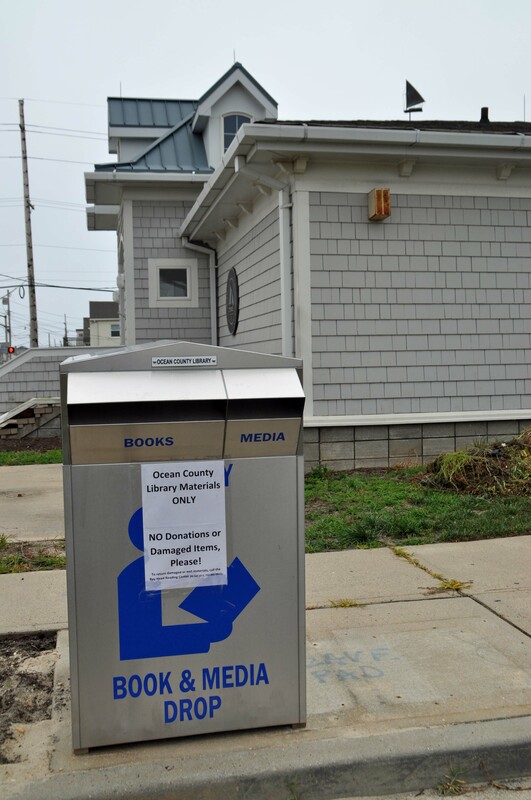 Ocean County Library has placed a book and media drop box at the Upper Shores branch, 112 Jersey City Avenue, Lavallette, to offer better service to our customers in the Lavallette and Upper Peninsula area. The Upper Shores branch was damaged by Superstorm Sandy last year and is currently undergoing renovations. The new drop box will give people the opportunity to return borrowed items, including CDs and DVDs, in their neighborhood and avoid having to make a trip off the barrier island. For access to library services, residents can use any of the 20 library locations. Those locations nearest to the Upper Shores branch include the Island Heights branch, 121 Central Av. ; the Toms River headquarters branch, 101 Washington Av. ; and the Bay Head Reading Center, 136 Meadow Av. Bay Head has temporarily increased the hours they are open: 10 a.m. to 5 p.m., Monday through Saturday. For more information visit the library’s Web site www.theoceancountylibrary.org or telephone the operator at (732) 349-6200. Friends of the Upper Shores library branch, 112 Jersey City Avenue in Lavallette, will present four band members who have performed in the annual New Year’s Mummers Day parade during a special program Wednesday Jan. 4 at 3:30 p.m. The library program, “Mummers and More: Celebrate the New Year with an age old Tradition,” will share the rich history and many customs of this Philadelphia-based organization. 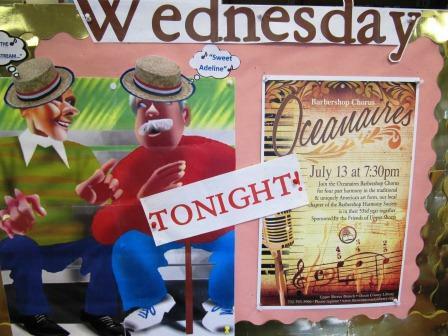 The four members will also perform at the library. The program is free and open to the public but registration is required. Telephone the branch (732) 793-3996 or visit the library’s Web site http://www.theoceancountylibrary.org to register. The Upper Shores Branch of the Ocean County Library (112 Jersey City Ave., Lavallette) will be closed Monday October 3, 2011 through Saturday October 8, 2011 for the installation of new carpeting and other renovations. The branch will re-open on Monday October 10th, for normal business hours from 10am-5pm. Customers of the Upper Shores Branch will be able to pick up requested items at the Point Pleasant Borough Branch (934 Beaver Dam Road, 732-295-1555) or they may designate any of the Ocean County Library’s 20 other locations to pick up items while the branch is closed. Customers may also return borrowed materials to any library location using the outdoor book drop at the Upper Shores Branch. 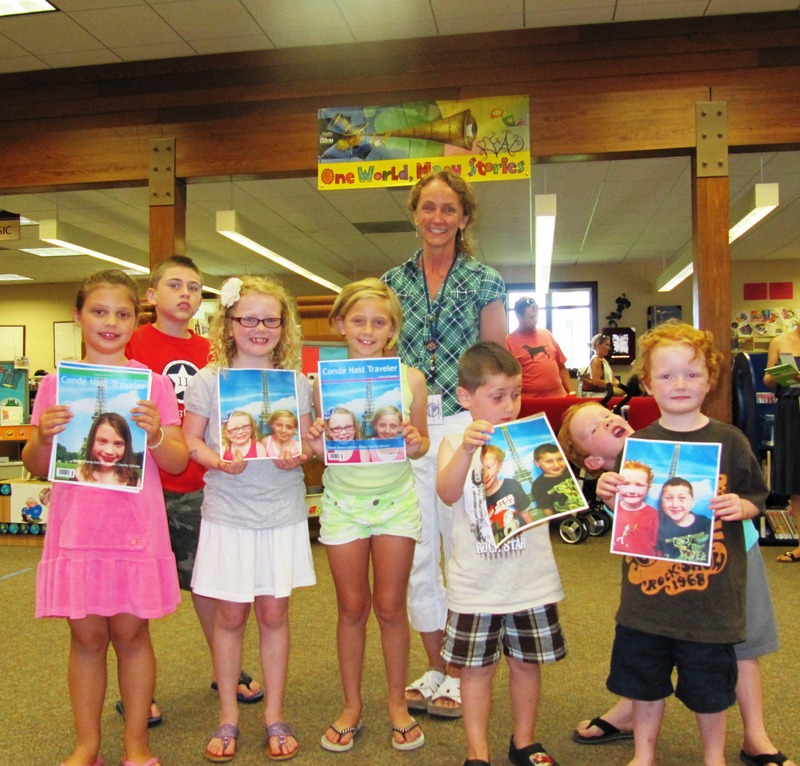 Captain Lisa Taylor (aka Upper Shores’ Children’s Librarian) led a crew of kids abroad on a memorable flight to France as part of the summer’s One World, Many Stories program. 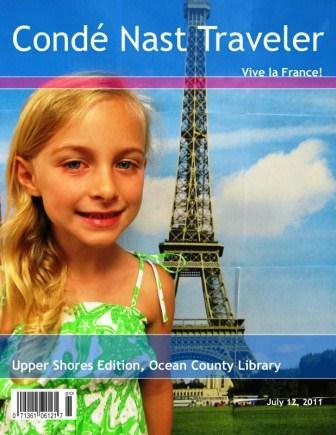 Creative components of Vive la France included language learning, song, activities, stories, and having a picture taken with the well-known national symbol, the Eiffel Tower ( a few travelers seen here)! Welcome aboard, Mrs. Taylor—we are happy you have joined the staff of Upper Shores! 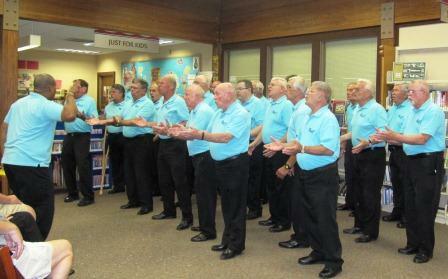 A Barbershop style concert of acapella, four part harmony brought down the house @ Upper Shores on July 13th. 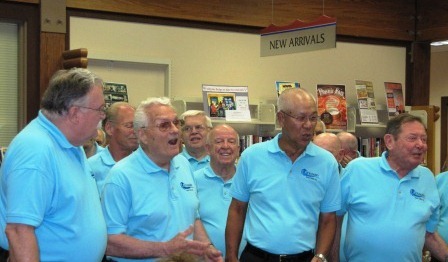 More than 100 people from ages 4 to 94 enjoyed the uplifting performance of the 25 man Oceannaires Chorus. Thanks to the Friends of Upper Shores for sponsoring this fabulous event! On Friday, July 8, children at the Upper Shores Branch of the library decorated and built their own kites. Each year, the library hosts the Kite Decorating Contest in conjunction with the Lavallette Municipal Alliance. Ocean County Library’s S.A.I.L. volunteers judged the contest, and the Municipal Alliance awarded prizes from Toys R Us and Seashore Delights. Each child went home with his own custom-made kite for flying at area beaches. 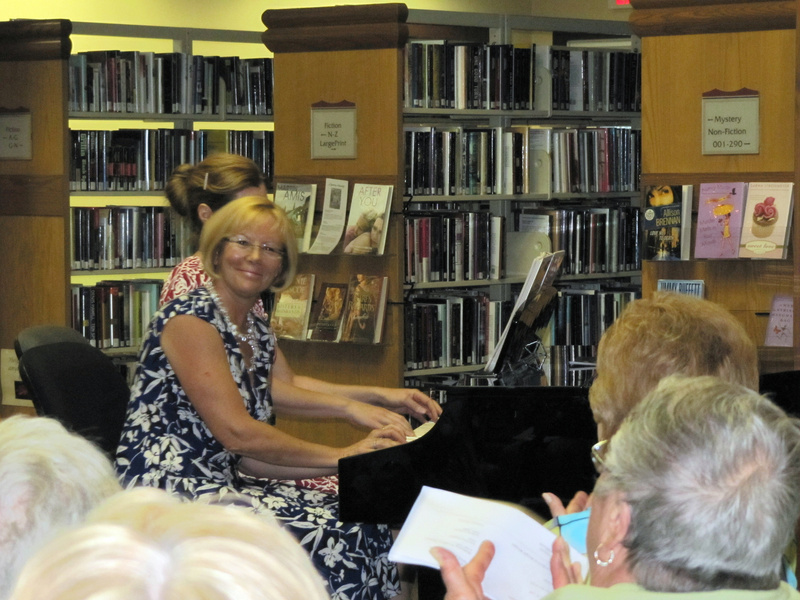 On Wednesday night, July 6th , the Upper Shores Branch hosted Four Hands, One Piano: a recital comprising the duo of Irene Kapp & Heidi Valvano. 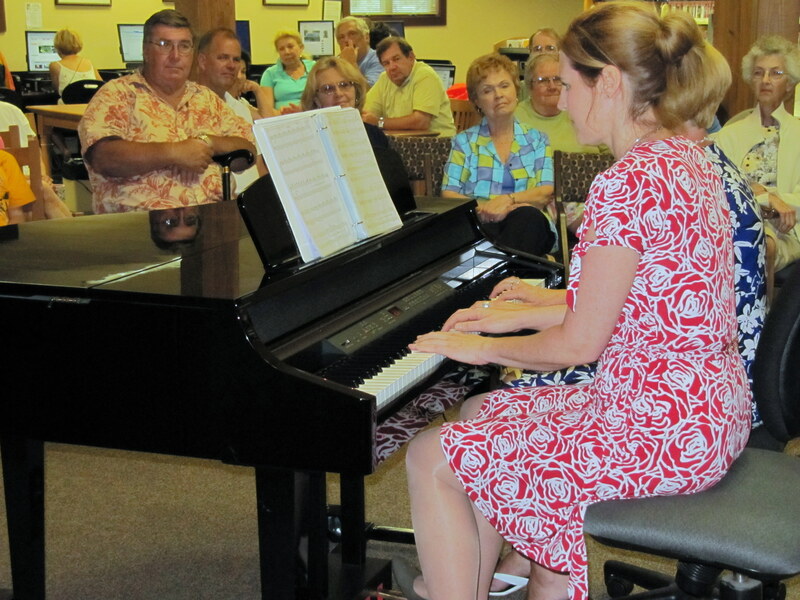 A capacity crowd enjoyed the musical evening of fun and anecdotes which ranged from Bach to Boogie Woogie and a tribute to Uncle Sam!